Don't forget to enter my Poppywinkle giveaway! The jacket was last worn here, top here, jeans here, shoes here and clutch here. 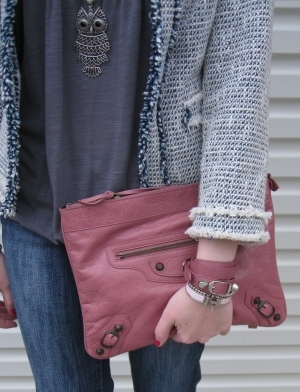 Ooooh, that clutch is pretty! uuuh I love the cardigan!! Beautiful outfit! I want all of the accessories and the bag for myself! I love love love OWLS. I have a necklace almost exactly like yours. Stop by our blog we are having a giveaway for a pair of Crystal Stud Earrings. I adore your jacket and your blog, it's so nice! Love the jacket! I really need to find me a tweed/woven jacket, so cute! Love your Balenciaga bag, so gorgeous! Your jacket is very Chanel-esque! Love it! What a cute owl necklace! Love your tweed jacket darlin! Looks great on you:)! the cardigan is amazing mica - love it!